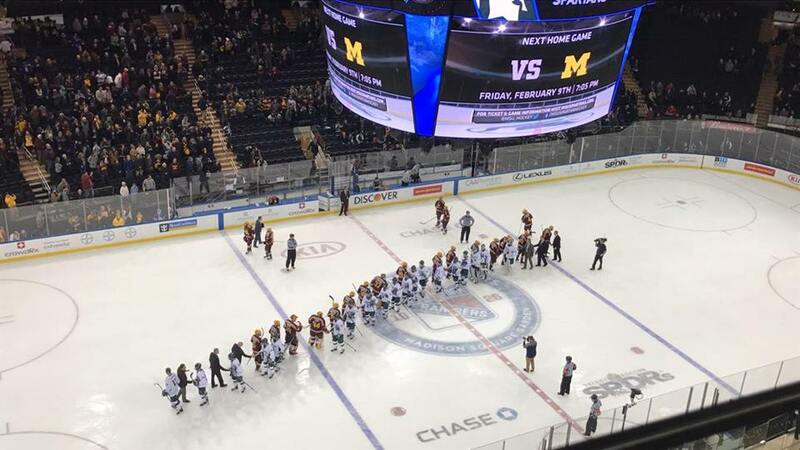 Minnesota and Michigan State shake hands on the Garden ice after a tough battle. Photo by Jason Schott. Today, the Big 10 Conference held its Super Saturday basketball and hockey doubleheader. Minnesota beat Michigan State 2-1 in hockey at night. Ohio State used a 17-0 run late in the first half to jump out to a 34-22 lead late in the first half and never looked back in their romp over Minnesota. Ohio State remained unbeaten in the Big 10 at 8-0, tied for first in the conference with Purdue, who is also 8-0. OSU is now 17-4 overall on the season. Keita Bates-Diop led Ohio State with 17 points (7-21 FG) and 12 rebounds to give him a double-double on the afternoon. Kaleb Wesson finished with 15 points on 7-9 shooting, including a three-pointer, and 11 of those points came in the first half, with eight rebounds, a steal, and an assist. CJ Jackson finished with 11 points, all of which came in the first half, on 4-11 from the field and 3-7 behind the arc, six rebounds, two steals, and an assist. Minnesota was held to 38.3 percent from the field, or 18-47 shooting. They shot 3-14, or 21.4 percent from behind the arc. Jordan Murphy led Minnesota with 13 points on 5-11 from the field, five rebounds, two assists, and two steals. Nate Mason and Amir Coffey had 11 points apiece, and Mason just missed a double-double as he notched nine rebounds. Dupree McBrayer finished with 10 points. 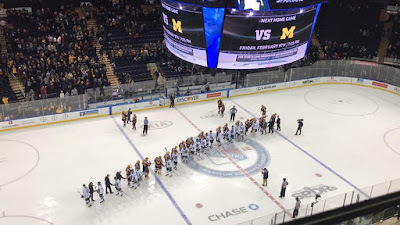 Minnesota, the 13th-ranked hockey team in the nation, knocked off Michigan State with a late goal from Brent Gates with 3:29 left in the third period. Gates was stationed at the top of the crease and was waiting for a rolling puck to get past a sliding Michigan State defender Butrus Ghafari, and it did. Whe it got to Gates, he buried it to give Minnesota the 2-1 lead. Gates got an assist on Minnesota's other goal by Casey Mittelstadt with 8:37 left in the first period that gave them a 1-0 edge. They would hold that lead until the third period, when Cody Milan tied it up for Michigan state on a feed from Jerad Rosburg and Jake Smith. Minnesota, in fifth place in the Big Ten, improved to 6-9-1-1, with 19 points in conference play, and 15-12-1, 29 points, overall. Michigan State, in seventh place, which is last place in Big 10 hockey, with a record of 3-12-1-1, 15 points, and 9-16-1, 25 points, overall.